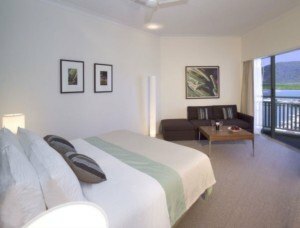 An oasis of luxury, Shangri La Hotel The Marina, Cairns is set on the heavenly location of Marlin Marina where the ocean water kisses the feet of the rainforest covered mountains. This magnificent waterfront hotel is located in the heart of Pier at the Marina which is the gateway to the world famous Great Barrier Reef. The sleek and stylish design of the hotel creates such an appearance that it feels like a piece of heaven on this earth. The entire premier hotel is decorated with glass, wood, and marble decorations. All the 255 guestrooms and suites are offered to the guests for their uncompromised comfort and luxury, and the rooms are attached to open balconies from where they can also get a peerless view of the endless blue ocean through the expanded gardens covered with rare flora. The interior decor of the hotel is totally based on local artwork and design.